Plans for a new commission to rival the SNP government's "national conversation" on independence have been passed by the Scottish Parliament. 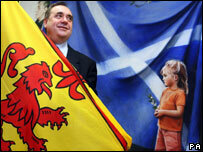 The group, proposed by Scottish Labour leader Wendy Alexander, would be set up to consider greater Holyrood powers. The proposals were backed by the other pro-Union parties. The SNP's Roseanna Cunningham said the plan, contained in a Labour motion debated at Holyrood, offered "no ideas, no policies, no future". Labour, the Liberal Democrats and the Conservatives said that, almost a decade after the laws to create the Scottish Parliament were passed, the time was right to re-ignite the debate with an independently-chaired commission to "review" devolution. Holyrood bosses will now consider the best way of establishing the review, including the issue of making parliament responsible for raising at least some of the cash it spends. Ms Alexander attacked the SNP's national conversation, saying the party had already decided on the only "acceptable" outcome, while also pointing out that there was currently not enough parliamentary support to stage an independence referendum. Ms Alexander told MSPs: "I believe that Scots seek a future that gives them the chance to walk taller without having to walk out. "And I say to the SNP, be very careful before you attempt to strangle at birth an initiative based on what the people of Scotland want." Tory leader Annabel Goldie said the national conversation was about "tearing up our constitution and ripping Britain apart", telling MSPs that the SNP did not have a monopoly on Scottish patriotism. "The majority presence in this chamber comprising the Labour, Scottish Conservative and Liberal Democrat parties, supports our continuing partnership with the United Kingdom," she told parliament. "The majority desire is to build on what we have and to take that forward." 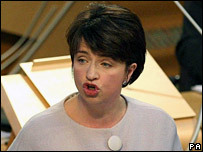 Nicol Stephen, the Lib Dem leader, said that any increase in Holyrood powers must include tax raising controls. "It will mean that a local income tax to replace the discredited council tax could be introduced straightforwardly - with all of the fairness and the benefits that can bring to the low paid and to pensioners," he said. "And it can avoid the regressive side effects of the SNP's council tax freeze policy." The two Green MSPs declined to back the Labour motion, or an SNP amendment welcoming the national conversation, which was defeated. One of their number, Patrick Harvie, said the Scottish people must be given the ultimate say on Scotland's future in a wide-ranging referendum, instead of the issue being bound by "the narrow interests of today's politicians". Ms Cunningham, who said the plan for a constitutional commission was an uncosted commitment, asked the chamber: "Does Wendy Alexander care? - no she doesn't. "Because it isn't really about moving anything forward except herself, preferably moving herself as far away from the rest of the news agenda as possible." The Perth MSP said the Nationalists could agree on more powers, on having a debate and asking voters to decide, adding: "What the SNP is not going to agree on is a stunted debate on the basis of Wendy Alexander's thus far but no further so-called vision. "Vision? I suggest she goes out and invests in a pair of specs because, on the evidence, her vision is woefully short-sighted." What is the cost of conversation?